Click on their links to learn more about them. 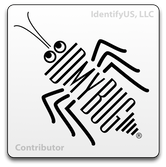 Contributors can be individuals or organizations that share resources on the IdentifyUS website. Examples include professional or hobbyist photographers that have libraries of unique and interesting images of subject matter that can support our identification services, or vendors that supply products to support the collection, identification and distribution of specimen samples to support our work while gaining additional visibility of your own products. Contributors receive no direct compensation, but instead get placement of their products or body of work in front of the worldwide IdentifyUS audience. Generally this includes URL links back to the individual contributor's source materials, attribution for images, graphics, pictures, diagrams or other content that you willingly allow us to present to our audience while crediting you. In some cases, contributors may also elect to participate in our Affiliate or Partner programs as well if that makes sense in any given situation. Photographers - you have compiled one or more libraries of images that can potentially assist in the process of identifying certain plants or animals at the genus and species level and can share them with IdentifyUS while maintaining your own licensing rights. Graphic artists - you have created proprietary graphic materials that help describe some aspect of one or more species' life cycles or physical appearance appropriate to the use and understanding of their identification and/or interaction with humans. This might include copyright materials or other materials under any type of creative commons licensing that allows IdentifyUS, with your express permission to share on our website. Government Agencies - materials that have been created at taxpayer expense and are now accessible in the public domain with appropriate attribution. For more information about our valued contributors, click on the links below. We hope you'll consider joining our circle of cooperators if you have materials of interest to share with our growing audience.